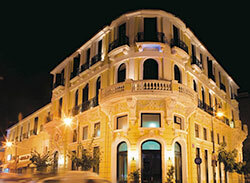 Built in 1921, Arni was one of the first hotel in the Balkans and a rare example of rococo architecture. 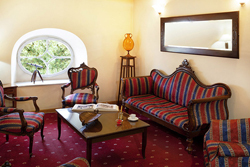 After its renovation in 2006, Domotel Arni has been transformed into an A-class hotel, where tradition, history and modern facilities blend together harmoniously. It is located at the heart of the beautiful and vivid city of Karditsa, in short distance from the mountainous regions of Pertouli and Elati, the breathtaking Meteora and Plastira ´s lake. The perfect starting point for exciting excursion to the amazing natural treasures of Central Greece. 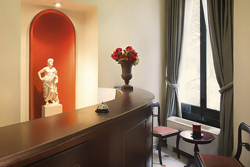 The future flirts with romantism in Domotel Arni. 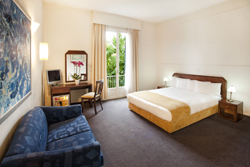 In each room, modern aesthetics blend, with the romantic past of the hotel. 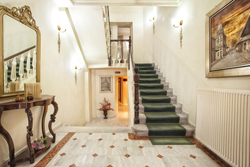 The hotel offers 31 rooms including 8 single, 17 double, 2 triple and 4 suites. All rooms at Domotel Arni are equipped with direct outgoing line, free wireless internet access (Wi-Fi), mini bar, laptop (upon request), fax machine (upon request), DVD player (upon request), safety box, pillow choice, room temperature control. 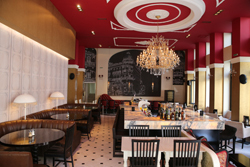 The renovated event hall: Theatro  located at the mezzanine of Domotel Arni and hosts up to 110 people. 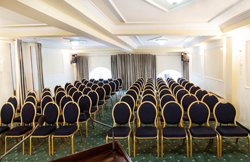 The theatrical arrangement is ideal for business conferences, seminars or professional meetings, while the hall is fully adjustable according to each event’s needs (school U , cocktail, buffet dinner style). The hall is fully equipped with flip charts, data projectors, DVD players, laptop, fax machine, etc. Theatro  is decorated with carefully selected furniture, creating an ideal place for successful professional activities (seminars, corporate meeting), as well as, social events. The hall’s abundant natural light ensures optical comfort and motivates the spirit of the participants. Coffee, refreshments and snacks are served in the area just outside the event room (breakout room).